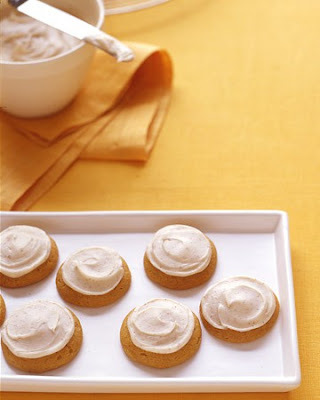 RWKrafts: Pumpkin Cookies... and my dumbest cooking mistake Ever! Pumpkin Cookies... and my dumbest cooking mistake Ever! I have a favorite book. It's called Martha Stewart's Cookies. I have never just sat down and browsed a cookbook before, but this book changes everything. Please please, for the sanity of your sweet tooth, buy this book if you don't have it already. Today I made Pumpkin Cookies with Brown Butter Icing, and also made the worst (worst!) and dumbest baking mistake I have ever ever made in my life. If I were blond, I could say it was 'a true blond moment' but I'm a brunette, so there is no excuse for my stupidity. Overall its pretty simple. Add your flour, salt, baking soda, baking powder, nutmeg, cinnamon, and ginger to a bowl and set aside. So the next step is where my brain completely was not working. I don't even know how I went so far in the process without realizing how dumb I was being. So, I thought I was done! Awesome I have all my ingredients, and Martha says to put the 'batter/dough' in a pastry bag, so I assumed it would be a little runny anyways. I made my makeshift ziplock pastry bag, put my 1.5inch circles on a cookie sheet and popped them in the oven! Wait. Why does it smell like my house is burning after only 4 minutes? They don't look like they're supposed to, dammit! Is this another Martha recipe that just takes too much finesse for me to handle? I frantically read through the ingredients. I added everything, and measured it all perfectly. Then I saw it. The very last sentence. "Add dry ingredients to the pumpkin mixture." OH YA, THAT! See, when I put together my bowl of dry ingredients, I really did 'set aside' like it told me to. And I totally forgot about it. Out of site out of mind. Oh my gosh how could I forget to add the FLOUR to a COOKIE recipe?! Ya I felt pretty worthless at this moment... So add your flour mix first! That's more like it! Cakey yummy spice filled pumpkin cookies! Bake at 375 degrees for 12 minutes. They really seem like they should be a cupcake/muffin recipe instead of cookies, but hey, they actually cooked this time so I was pleased. I couldn't wait til after dinner, they just smelled way too good! So I've shared my dumbest baking moment in my adult life. What was your biggest 'oh duh!' cooking moment? This is definitely a mistake I will never forget! These sound delicious! I've made similar mistakes when cooking, but its definitely the kind of mistake you only make once! Those look great! I have that book and have tried lots of cookies, but not that one. I'll have to try it out. My favorite is the chewy chocolate chip. Tammy... ooh... they look good... with hot tea! Well, I have definitely made my share of baking mistakes. :) Glad you were able to fix the problem though. And your cookies look really tasty! Ohhh, these look so good! I'm going to have to try them, if just for the icing. Don't worry about the mistake, it happens to everyone. I often get in the middle of a recipe and realize I don't have one of the ingredients. :P Thanks for linking up!! Those look so good! I am glad you got them right! But don't feel bad because I HATE cooking and fo stuff like that all the time. I usually quit right after something like that happens! I am glad you took a picture of it. Looks really delicious. Have a great wknd! Rachel they look so yummy. I love baking cookies but dont nowadays as they disappear way too fast and the kilos appear faster!! Aw...Rachel, your post is so sweet and makes me smile BIG!!!!!!!! I have that MS cookie book! I must try that and make sure I remember to ad the DRY ingredients as well! LOVE your sharing from your mistakes and success! It's all part of the process of becoming a great home cook! Way to go, Rachel! OMG, you are toooooo funny. That is so something I would do. I'm brunette. I have to stick to the cookies you take from the fridge, cut into cubes and place in the oven. Your second batch looks yummy. Heee! My dumbest moment occurred when I made brownies, and they literally rolled back from the pan like a carpet just rolling up. I made the batch from a BOX not even from scratch! My sister asked if I put the eggs in. I swore up and down that I did. When I was turning on the sink to scrape them out, there at the bottom of the garbage disposal was one lovely whole egg. It must have rolled off of the counter and into the sink, going right down the drain (unscathed) to the bottom!! I think your pumpkin cookies look BETTER than Martha's! XOXO! Oh well you recovered nicely!! They look and sound yummy! Thanks again for linking up to Show & Share! CAS-ual Fridays with Lawn Fawn! Halloween Cards Galore and a DT Tryout! One Year Ago - Why am I Here? Orange You Ready to Trick or Treat?